TWISTED TEA HALF AND HALF – Perfect for a hot day, whether you’re floating down a river or playing a round of golf with your buddies. Our Half & Half combines classic flavors of iced tea and lemonade, with a kick. 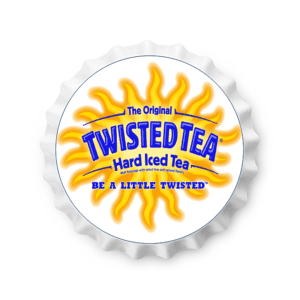 TWISTED TEA LIGHT – Twisted Tea Light has all the things you love about Twisted Tea, with only 115 calories. Save room for more BBQ and pie, and Twisted Tea, with Twisted Tea Light. 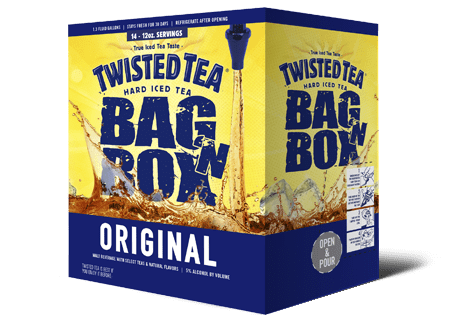 TWISTED TEA ORIGINAL – Our fans love Twisted Tea Original’s true iced tea taste. They also love fast cars, loud music, liberty and justice, and really big BBQ grills. For a refreshing and smooth taste, we use select tea and natural lemon flavor. It’s delicious. It’s a little twisted. TWISTED TEA PEACH – Calling someone “a real peach” comes from an old tradition of giving a peach to someone you like. Tell your friends how you really feel and give them a Twisted Tea Peach, the hard iced tea that combines real iced tea flavor with the refreshing fruit flavors of peaches.